Here at Meadow Vista Veterinary Clinic, we see a wide range of animals including Bovine (cows), Equine (horses), Caprine (goats), Ovine (sheep) and Porcine (pigs). Services include vaccinations, well checks, treatment for minor colics, lacerations, dental procedures (floats), cold laser therapy, lameness, and emergencies. Also, we provide health certificates for travel to different states. (requirements vary for more information go to import requirements ) Both Dr. Pam Pussich and Dr. Joe Sheldon are versed in large animal medicine as well as small animal medicine. As a part of our commitment to providing quality medicine for our patients, we are equipped with digital radiography which allows us to provide our patients with safer, more efficient imaging services. Digital radiography is safer for our patients because it exposes them to less radiation by making imaging easier to complete. Yearly examinations allow us to monitor the health of our patients which includes checking the teeth. At the time of the horses exam, our doctors may recommend floating. We require sedation for the floating procedure because we are able to balance the mouth for equal wear on the teeth. The reason we require sedation with horses is because instinctively they are flight animals and react to the equipment used. We are able to perform both hand and power floats depending on what the patient needs. Horses have hypsodont teeth that do not have nerves close to the surface like humans do. Their nerves are deeper within the tooth so floating does not cause them pain unless it is overdone. 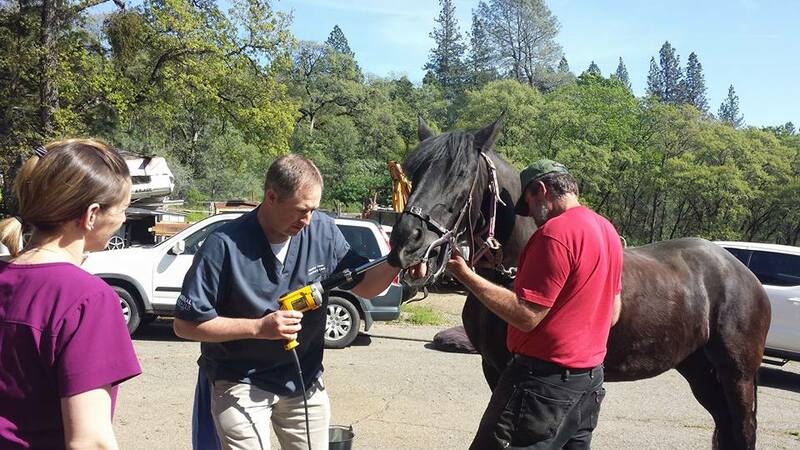 Companion Laser Therapy can help a multitude of problems commonly seen in our equine friends. The most common being acute and chronic laminitis, acute and chronic back pain, back disorders, degenerative joint disease, foot disorders, fractures, greased heels, hip joint disorders, hygroma of the elbow, joint related injuries, lameness disorders, tendonitis, and wound healing. For a full list of treatable conditions click here.